Take your gentle holiday and experience wellness in Untouched Nature, Ultimate Pampering and Uniques Therapies with CHIIDA SPA at the 2 Locations in Chiangmai. In our spa, you will feel all over with experience professional therapists under best practice skillful of Massage techniques who will gentle caring and pampering service. You could imagine that you are touched from our mind service of THAI way. 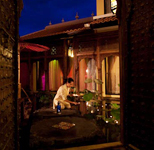 Conscientious attention is paid to every element to produce a completly rejuvenating spa experience. The select treatment customized and developed meticulously in the menu by menu from the professional certified practioners in Ayuravedic and THAI LANNA in especially.